The first clip is from Richard Jones’ challenging production of Wagner’s Lohengrin starring Jonas Kaufmann and Anja Harteros. It a show that I had some mixed feelings about at the time. I even felt that Kaufmann seemed a little darker for the role than I might have liked. (Take a look for yourself above.) Seeing the performance again on DVD, I'm overwhelmed by his, and the entire casts', quality. I must admit that I was surprised how much the production stayed with me over the ensuing months eventually becoming one of my favorite events of 2009. This one will be hard for anyone else to live up to in my mind for a long time. 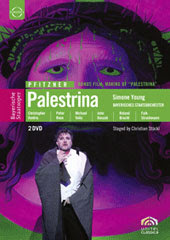 And while it hasn’t received anywhere near as much attention, the 2009 production of Pfitzner’s Palestrina that was preserved In Munich at the same time was no less important and just as unforgettable. Simon Young led the orchestra in a vibrant and often funny day-glo staging from Christain Stückl. Christopher Ventris sings the role of the troubled composer making his own mark on musical history amongst a huge cast. The operatic version of the Council of Trent is certainly a thousand times more fun than the real thing. You’re not likely to hear this early 20th Century romantic work elsewhere, and this lovely video shouldn’t be overlooked. 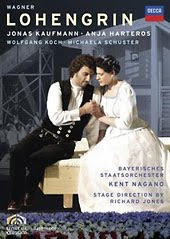 I received the Kaufmann DVD for my b-day and have been watching it relentlessly. I think Harteros' soprano almost sounds like Gheorghiu's: dark, lustrous, and mysterious. As for Herr Kaufmann, well, look at him.